Autodesk® Nastran® FEA solver software analyzes linear and nonlinear stress, dynamics, and heat transfer characteristics of structures and mechanical components. Part of the Autodesk solution for Digital Prototyping. Autodesk® Nastran® software ceased to be available as a stand-alone offering following version 2018. In an effort to streamline the user experience and deliver more value to customers, Autodesk® Nastran® functionality is now available in Autodesk® Inventor® Nastran®. 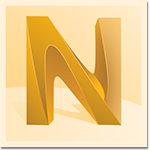 Autodesk® Inventor® Nastran® is available to education users here.